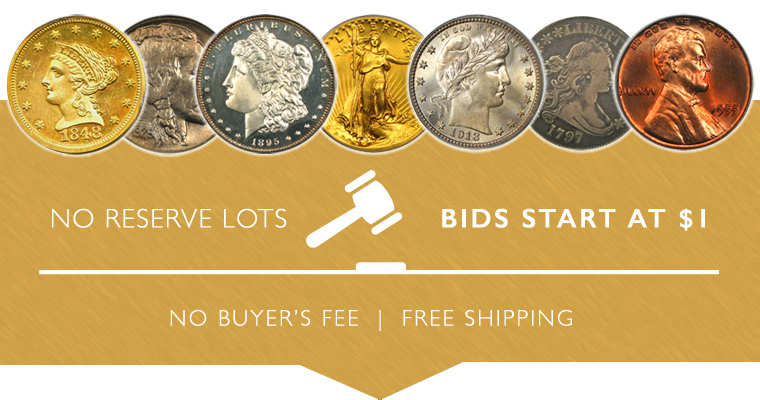 Our Sunday Internet Auction #1035 offers a fantastic selection of 400 New Items, along with 55 Special No Reserve lots and 50 Vault Value items. We are excited to offer Part 3 of the Creole Collection starting today in our Sunday Internet Auction #1035. Over 90 certified pieces are available with a heavy concentration of exquisite $10 & $20 gold and a smattering of popular O-Mints. Highlights include a better date 1839 $5 PCGS MS61, a low pop 1800 $10 PCGS XF45, a rare no motto 1852-O $10 PCGS AU55, a super rare 1855-S $10 PCGS AU50, an scarce civil war double eagle 1861 $20 PCGS/CAC MS62 and very tough date 1909-D $20 PCGS MS64+. Be sure to browse all the exciting offerings from Part 3 of the Creole Collection, closing Sunday, October 21st. Our first highlight is a 1799 $10 NGC MS61 (Large Stars Obverse), and of the 37,449 pieces minted, only ten graded MS61 by NGC. This example is well-detailed and has a pleasing look with nice luster. This week's second highlight is a 1932 $10 PCGS MS66+. This nice Indian eagle type coin is well struck with excellent luster, and very pleasing in hand. Only 20 examples have graded MS66+ by PCGS with a single piece graded finer! This week's final highlight is an S.S. Central America: 1857-S $20 PCGS MS63 (Bold S, 20B, with Box & COA). This exciting double eagle gold coin is from the famous SS Central America shipwreck. Of course there are many other highlights, so be sure to browse all lots in this exciting new sale before it closes on Sunday, MONTH DAY.